Let me start by saying my life was completed yesterday. 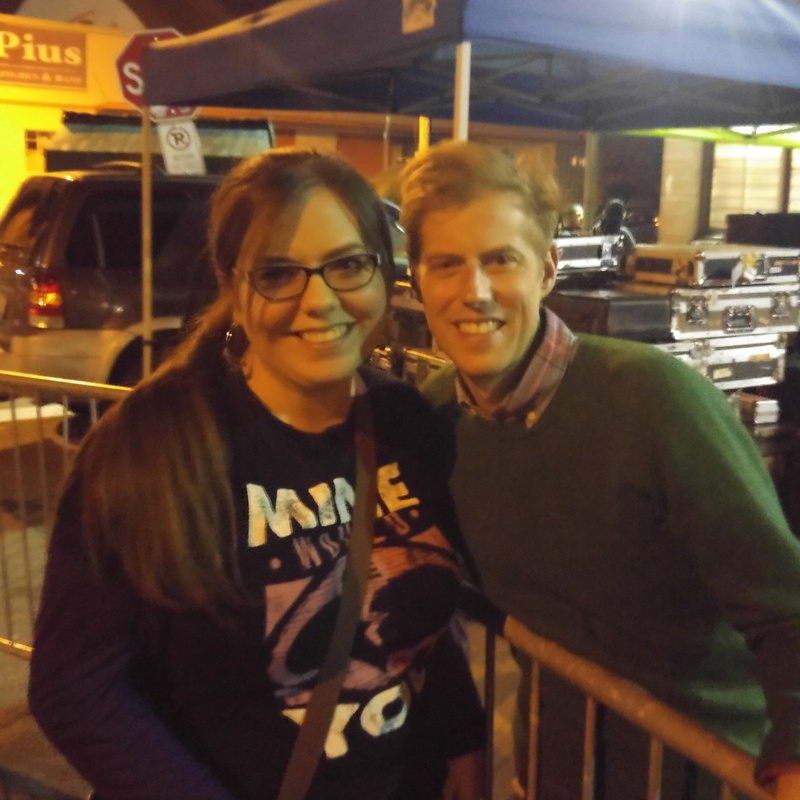 I got to see my favourite musician in the world, Andrew McMahon, in concert (not for the first time) and he played such an amazing mix of old and new music. After the show, I got to meet him, hug him, get my picture taken with him, and have his new CD signed! An even better bonus is that I took the day off work today and am just at home enjoying my free time! In almost equally exciting news, I made this uh-mazing avocado macaroni and cheese the other week, by Two Peas and Their Pod. Seriously. Creamy and cheesy pasta plus creamy and smashed avocado…all mixed together? How does it really get any better than that? I was a bit perplexed at first, since it is definitely a little different, but the outcome was so, so, so amazing. There was plenty for leftovers the next day…which I must admit was a bit odd, given that avocado browns over time, however the browned part is still edible, but also it only browned on the very top, so if you prefer, you can scrape off the browned part and then chomp away! One of the best parts also was the chopped chunks of avocado that the recipe calls for you to throw in the finished product. Once again I say…SERIOUSLY. Creamy. Cheesy. Smooth. Avocado. Pasta. What else is there in life? Ok ok, a lot of things. But food wise, this basically takes the cake for sure. -Bring water to a boil in a large pot. Salt the water and add in macaroni. Stir and cook until al dente, about 8-10 minutes. Drain and set aside. 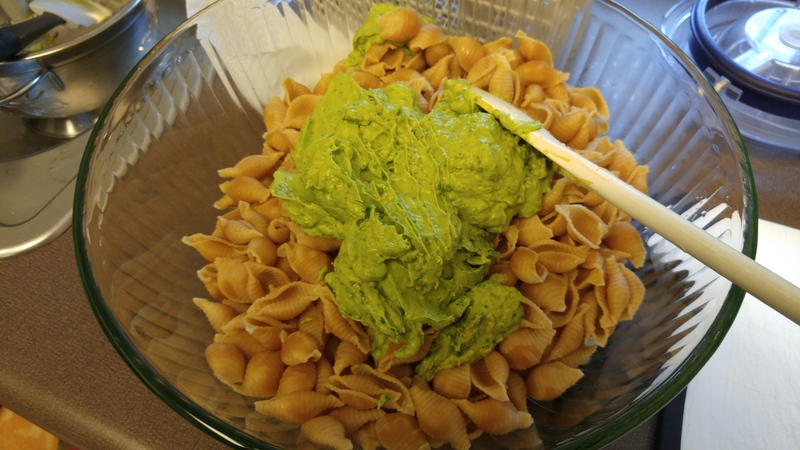 -While the pasta is cooking, make the avocado sauce by placing the garlic, avocados, lime juice, cilantro, salt and pepper into a food processor or blender, and process until smooth and creamy. Set aside. 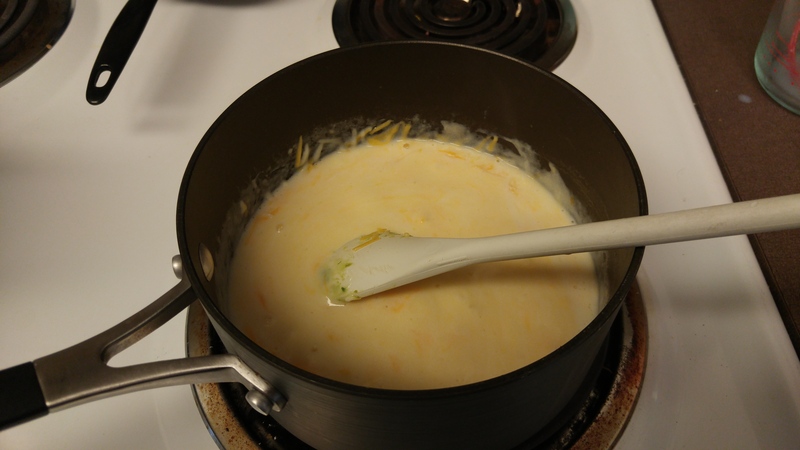 -Make the cheese sauce by placing the butter in a small saucepan and heat over medium heat. When melted, whisk in flour to create a paste, then whisk in milk until smooth. Stir with a wooden spoon until the sauce starts to thicken, then add in Pepper Jack cheese and stir until cheese is melted and sauce is creamy. 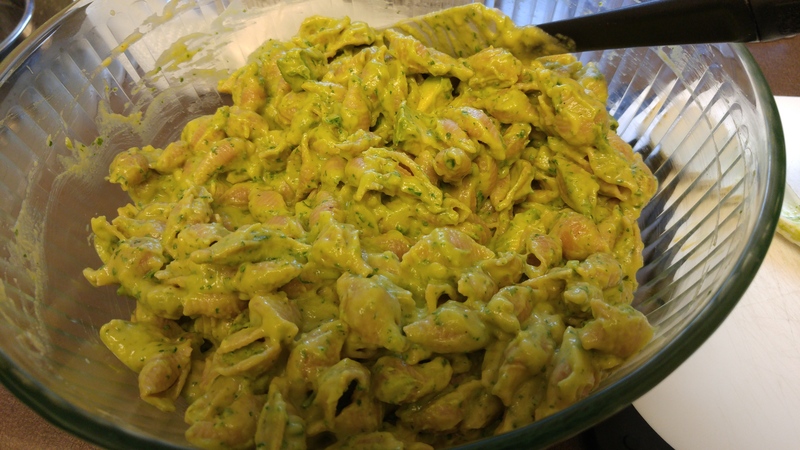 -Transfer the macaroni to a large bowl and pour the avocado sauce over the macaroni and stir until well coated. Add the cheese sauce and stir until macaroni is covered and becomes creamy. Season with salt and pepper, to taste. 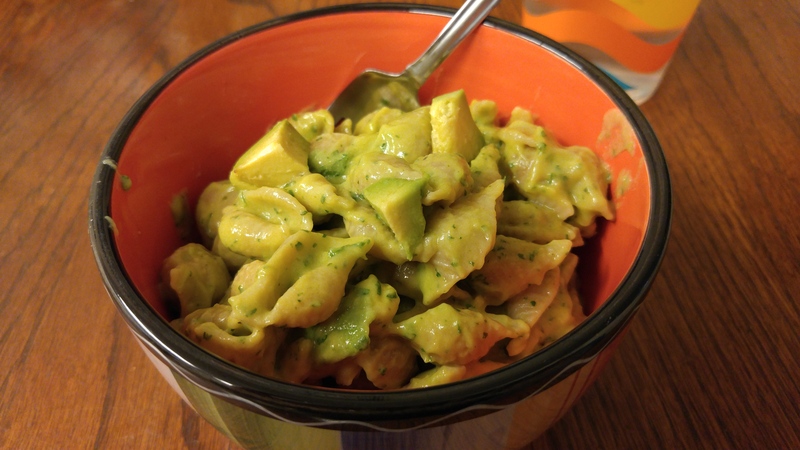 Serve hot and garnish with fresh avocado chunks. Recently, my mom tried out Blue Apron for a couple of weeks. It is a meal service that delivers ingredients right to your door. You can choose the frequency and my mom was on a plan for 3 meals per week that serve two people each. That totaled about $60, which actually isn’t *too bad* of a price. 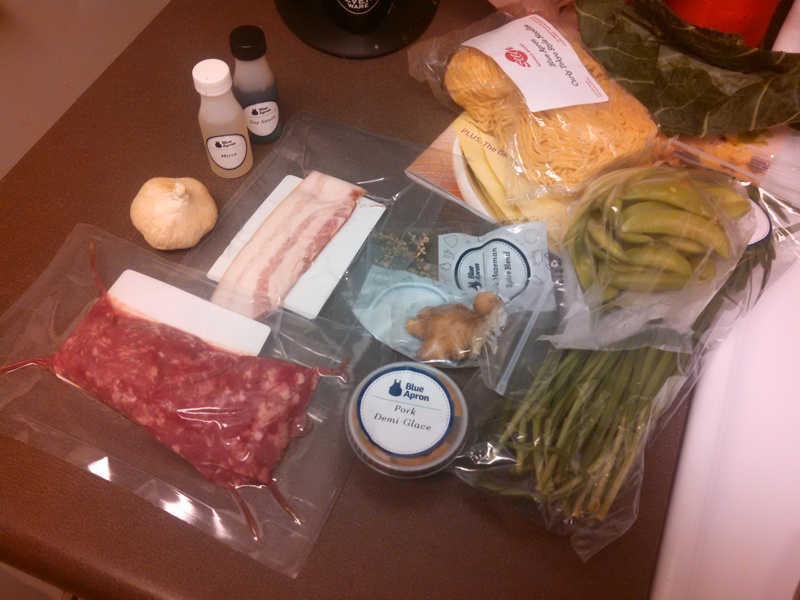 The neat thing about Blue Apron is that everything is sent in neat little packaging and contains the precise amount of each needed ingredient. My mom ended up canceling her subscription, because the price did add up after awhile, plus she is not quite as adventurous of an eater as I am, and Blue Apron really offers a wide variety of dishes, an she is more of a meat and potatoes type of gal. Though she did like that it helped her prepare even simple vinaigrette from scratch, the type of thing she is not inclined to make on her own (similar to most people!). Similarly, this recipe calls for a pork demi-glace, which is basically a fancy rich, thick type of stock. I don’t think I would ever make it on my own, but you can google recipes for it, but I am not sure where you might find it in a store. In any case, my mom gave me one of her meals, which was this Triple Pork Mazeman. It was delicious! 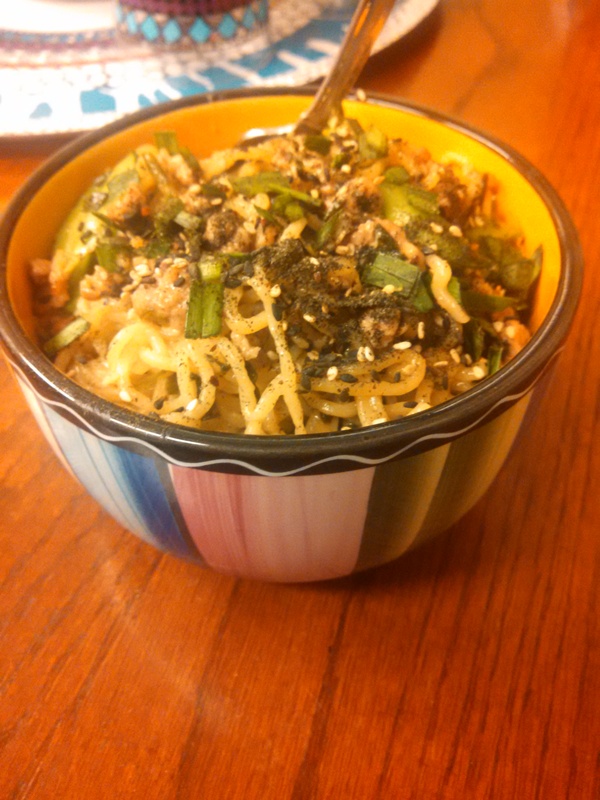 It turns out that mazeman is a type of ramen, but it is dry, and made with a thin sauce instead of a broth, allowing the toppings to take on center stage, in this Japanese dish, according to the recipe page! -Preheat the oven to 475F. Cut off and discard the top of the garlic head (to expose the cloves). Place it on a piece of aluminum foil, then drizzle with olive oil and season with salt and pepper. Tightly wrap the foil around it, place on a cookie sheet, and roast for 28-30 minutes. Set it aside, to cool. -While the garlic is roasting, heat a large pot of salted water to boiling (you’ll come back to this later). Dice the bacon into very small pieces, mince the garlic chives, cut the pea tips into one inch pieces, and peel and mince the ginger. -In a medium pot, heat one teaspoon of oil on medium. Once hot, add the bacon and cook for about 3-4 minutes, or until browned and crispy. -To the bacon pot, add the ginger and all but one pinch of the garlic chives. Cook, stirring often, for 2-3 minutes, or until soft and fragrant. Add the ground pork and cook for 4-5 minutes or until heated through, breaking the meat apart with a spoon; season with salt and pepper, then remove it from the heat. -When the garlic is done and has cooled enough to touch, squeeze the individual cloves out of the head. Add the pork demi-glace, soy sauce, mirin, roasted garlic cloves, and one cup of water to the pot with the pork mixture, and stir to combine. Turn to high to bring to a boil; once boiling, reduce it back to medium and let it simmer, while stirring, for 2-3 minutes, until it reduces in volume. -While the sauce is simmering, add the noodles to the pot of boiling water and cook and stir for 90 seconds (no longer), then drain well and immediately add it to the sauce pot. Cook and stir constantly for 1-2 minutes, then turn off the heat. Stir in pea tips and season with salt and pepper to taste. -Spoon the finished product into each bowl and then top with the remaining chives and spice blend. Fried rice really is one of those simply delicious dishes, isn’t it? I don’t make it very often, but it is so easy to do and so tasty!! This “better than takeout” chicken fried rice comes from The Recipe Critic and it did not fail me at all. It calls for just a few ingredients that aren’t expensive and are easy to find, which is always a bonus. I used minimal peas in this, because my husband is not a fan, but I used tons of fresh green onion from my garden! This is a quick meal to throw together, so it is pretty good for any night of the week. It can be even faster if the chicken is already cooked. 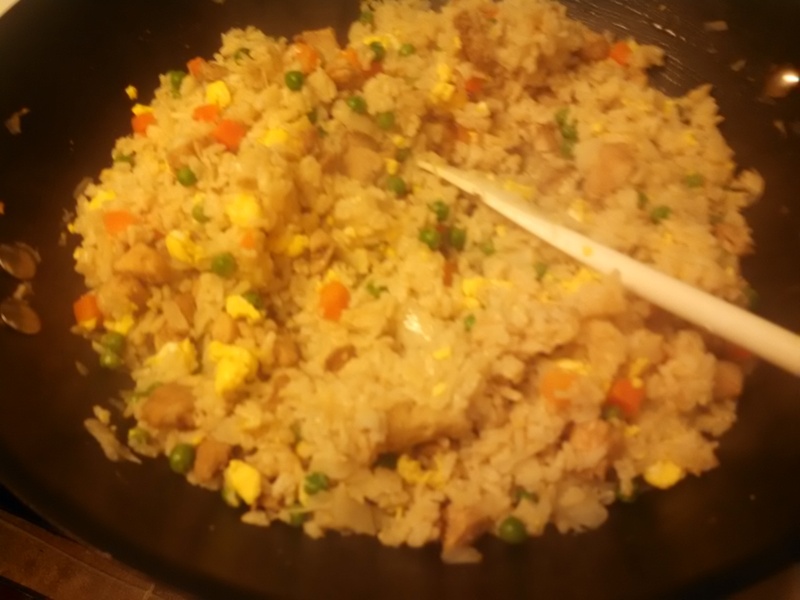 I have also been told that it is best to use day-old rice for fried rice dishes, so the bulk of this could be made in advance, which definitely saves time as well. Enjoy! -Cook and shred the chicken (you can cook the chicken in this sauce also by The Recipe Critic, which I did, and it was fabulous!). -Preheat a large skillet or wok to medium heat, then pour sesame oil in the bottom. 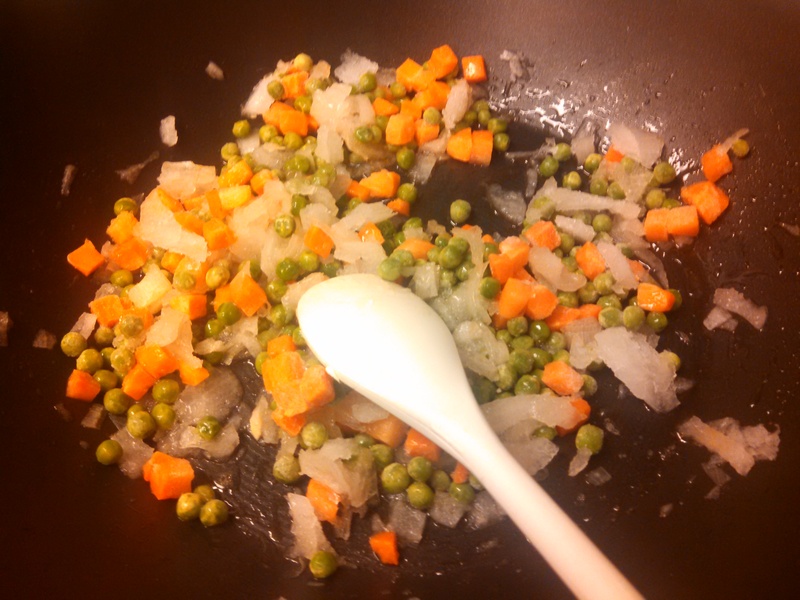 Add white onion and peas and carrots and fry until tender. -Slide everything to the side of the wok, and pour the beaten eggs onto the open space. Scramble the eggs with a spatula, and one cooked, add everything back together. 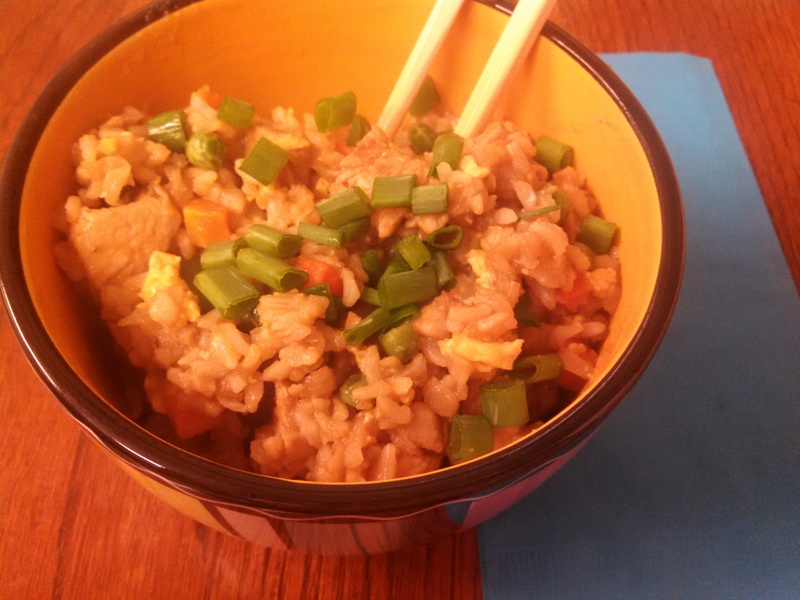 -Add the rice and chicken to the veggie and egg mixture, then pour the soy sauce on top. Stir fry everything together, then add the chopped green onion on top. These Thai Larb Chicken Lettuce Wraps come from Cupcakes and Kale, and were so delicious and flavourful! 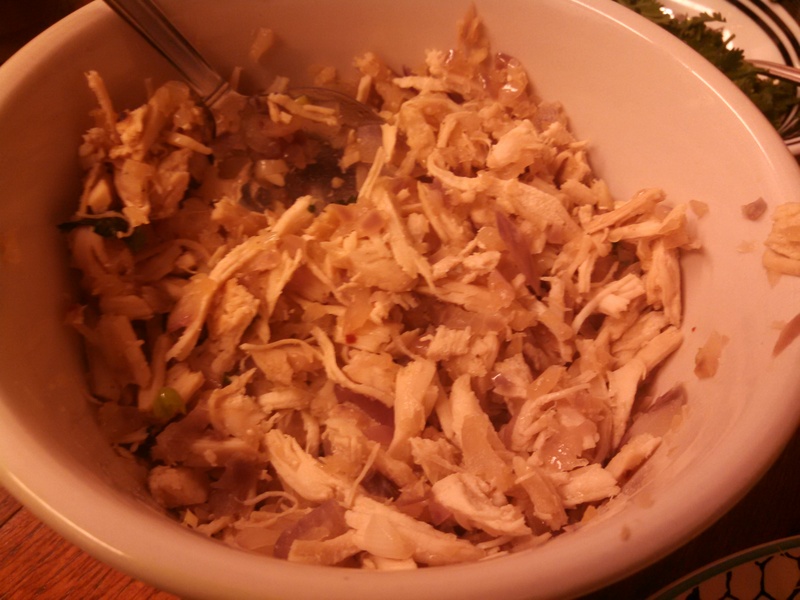 I had never heard of it before, but the blogger includes a note stating that Larb is an Asian salad that is apparently the national dish of Laos. The salad features a spicy and sour stir-fried meat on top of cold, crisp lettuce. 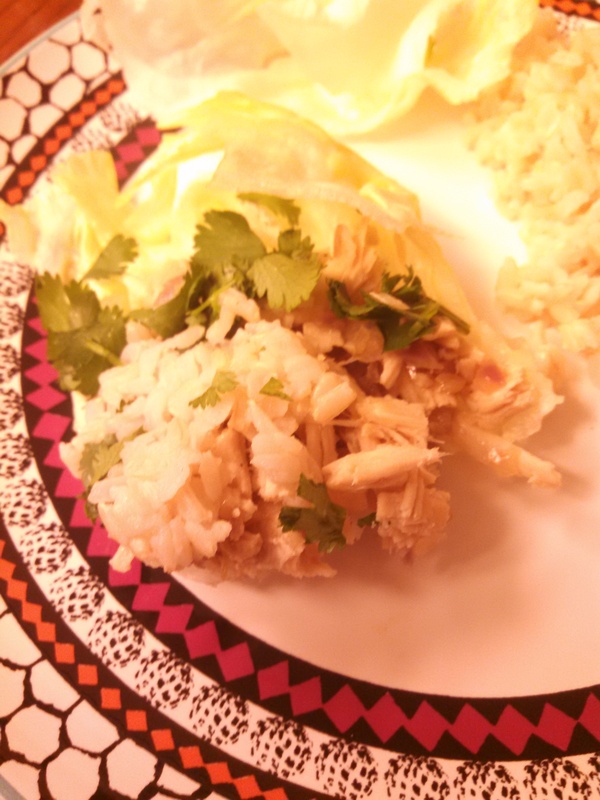 The dressing typically consists of fish sauce, spicy chiles, lime juice, and mint leaves. Pretty much anything goes well in a lettuce wrap, and I was definitely loving these! -Heat a wok or large sauté pan over high heat. Once hot, swirl in 1 tablespoon of the oil and chicken. Break up the chicken and cook. -Once cooked through, push the ground chicken to one side of the pan and swirl in the remaining ½ tablespoon of oil. Then add the shallots, red onion, garlic, and fresh chiles, and sauté until fragrant, about 30 seconds. 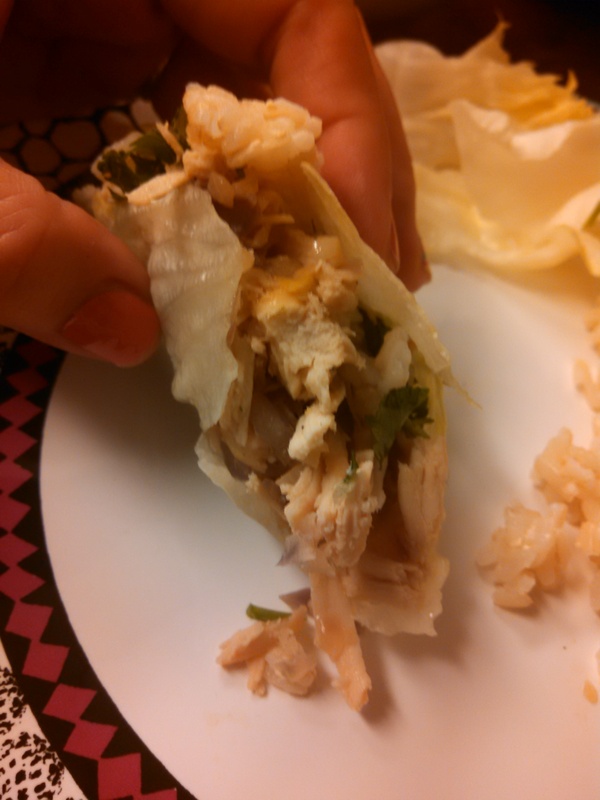 Add the fish sauce, lime juice, and soy sauce, and mix everything together. -Spoon the mixture into the lettuce cups and top with herbs. Enjoy! In the summertime, a lot of times people don’t want to turn on their ovens. I am one of those people. Also in the summertime, a lot of people don’t think to cook with spaghetti squash. 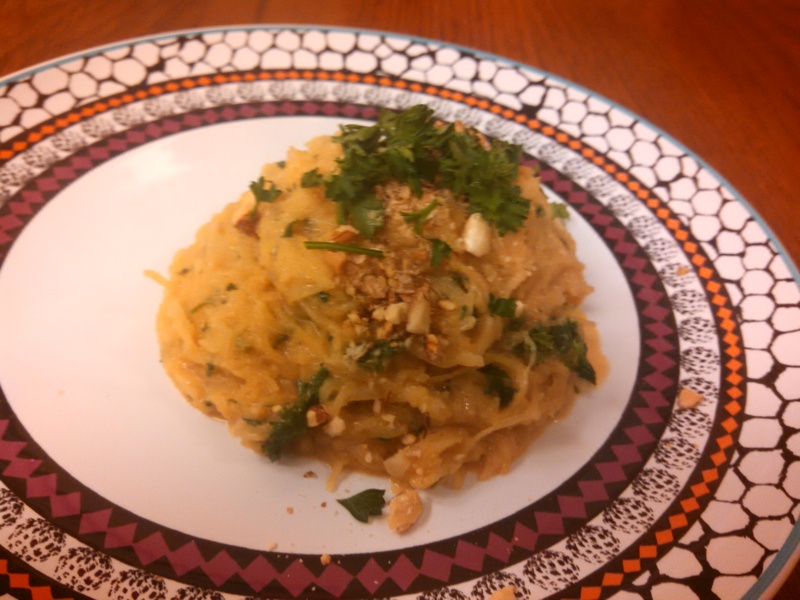 However, this Thai Peanut Sauce Spaghetti Squash by Leelicious, which my good friend Alysha turned me on to, is an exception! I ended up not being able to find the coconut sugar, however I has googled how to use regular sugar or brown sugar and it still worked out well, though perhaps would have had a different flavour if I’d found the Asian-esque coconut variety. I hope you like it, and that it’s worth turning on your oven for, in this summer heat! -Preheat oven to 350 F. Cut the squash in half and scoop out the seeds. -Drizzle the inside with olive oil and sprinkle with salt. 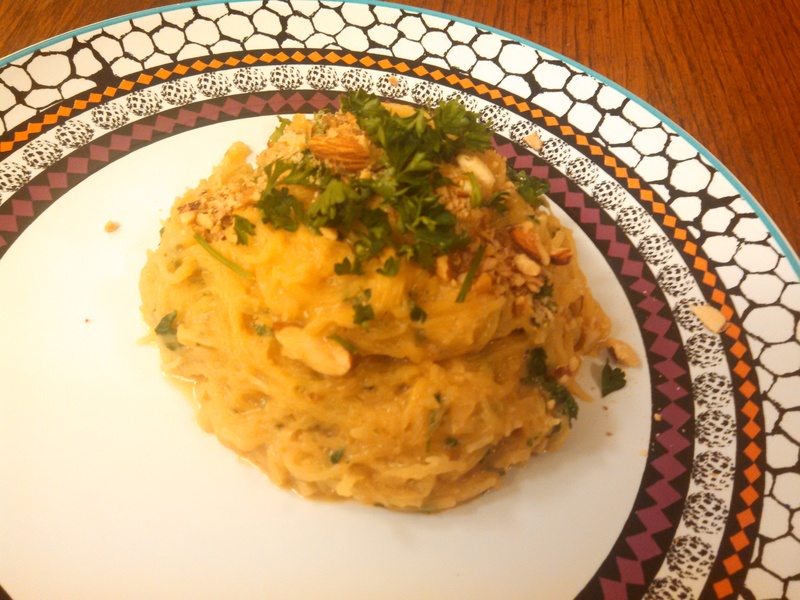 Place spaghetti squash cut side down on a baking sheet and roast for 25 minutes. 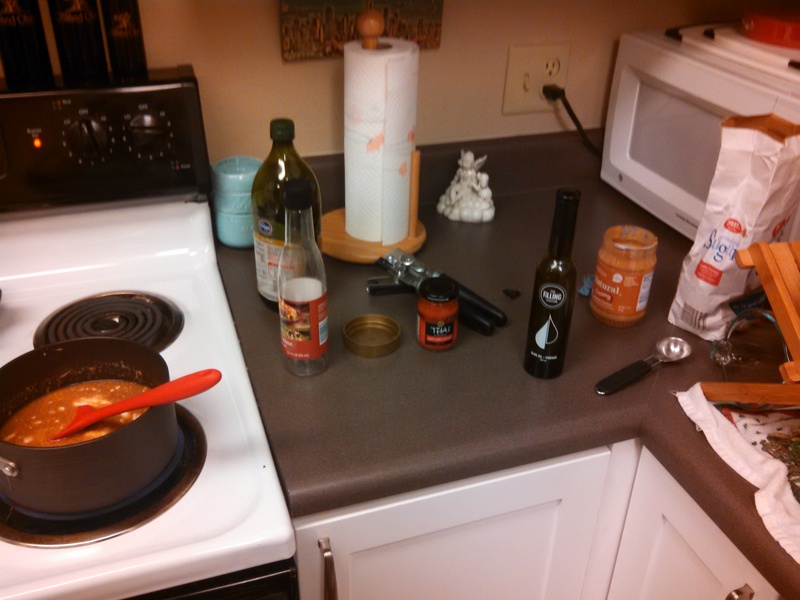 -Place all sauce ingredients in a medium saucepan and bring to a boil over medium-high heat. Then turn down to low and simmer for 5 minutes while stirring almost constantly, then take off the heat to let cool. -When spaghetti squash is done roasting, take it out of the oven and let cool for 10 minutes. Then, using a fork, scrape out the spaghetti squash strands. If your squash is very moist, you might have to place the strands in a colander and pat with paper towel. -Heat a skillet over medium heat. Add the minced garlic, chopped parsley and 1/4 cup of the peanut sauce pan and combine. Add spaghetti squash, rest of the sauce, and crushed peanuts, stir to combine and cook until heated through (about 2 minutes).